Pop singer, Hebe Tien (田馥甄) held her 'To My Love' concert to celebrate the success of her album, 'My Love' on December 3, 2011 in Taipei, Taiwan. 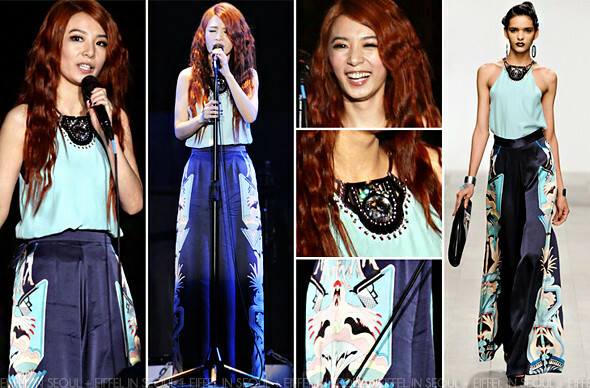 Hebe Tien (田馥甄) opted for a satin jumpsuit from Holly Fulton Fall/Winter 2011 collection. Accessorizing her outfit similarly to the runway sans waist belt. Absolutely love the look. Her auburn hairstyle tops it off! Definitely a plesant surprise to see a Taiwanese dressed in Holly Fulton. Let's hope this is not the last time.